Pasadena&apos;s Colorado Street Bridge, which has been dubbed "Suicide Bridge," is adopting a new strategy to discourage would-be jumpers. The city will put up signs with hopeful messages such as "Life Is Worth Living" and "You Are Not Alone," as well as the phone number for a suicide prevention hotline, CBS News reports. More than 100 people have jumped off the nearly 150-foot bridge since since 1915, most of those reportedly occurring during the Great Depression, according to city officials. There have been 13 suicides since 2006. "If we can save even one life with one reasonable step we can take, we should," said Pasadena City Councilman Steve Madison, one of four elected city leaders to endorse the signs during a public meeting, the Pasadena Sun reports. The city plans to put up four of the inspirational signs, two at either end of the bridge, by August. Dr. Paula Clayton, medical director of the American Foundation for Suicide Prevention, told KNX that similar signs on another famous bridge for jumpers hasn&apos;t had much effect. "It&apos;s a nice first step, but the Golden Gate Bridge does have signs, and yet it hasn&apos;t changed the rate of people dying by jumping from that bridge, so it&apos;s doubtful," Clayton said. Pasadena Police Chief Philip Sanchez told the Sun that the the signs are "one piece of a very complex solution to addressing suicide" that must include expanded public mental health services. The bridge was built in 1912 and celebrates its 100th anniversary this Saturday with a “Happy Birthday Pasadena: Celebrating Bridges" festival. 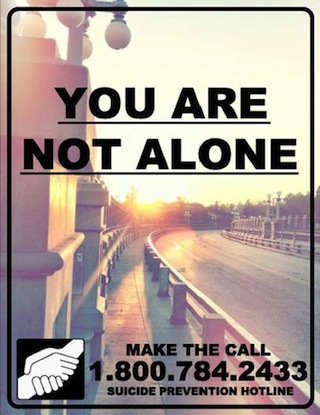 If someone you know exhibits warning signs of suicide: do not leave the person alone, remove any firearms, alcohol, drugs or sharp objects that could be used in a suicide attempt, and call the U.S. National Suicide Prevention Lifeline at 800-273-TALK (8255) or take the person to an emergency room or seek help from a medical or mental health professional.